Samurai House Street (上山武家屋敷通り) of Kaminoyama is the street with four remaining samurai houses. Morimoto House, MIwa House, Yamada House and Sogabe House are remaining Samurai houses. Miwa house is opened public and see the inside of the house. Others are opened for only gardens. You can see what are the real Samurai house and structures. Admission of Miwa House: 200 yen. When Kaminoyama Castle was built in 1535, the castle lord also built samurai houses on the north and west side of the castle. All of those remaining houses are built in 17th century. ... was built in 1861. The garden of this house was called Kogaen with yellow flowers. ... was built in late 18th century. 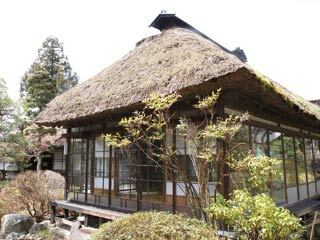 This house is opened public and remains many structures of what Samurai house used to be. ... was built in 1804 and takes Magariya Kayabuki style houses. The garden called Shoin tei with a big pine tree. ... was built in 1783. This house was for middle class samurai.